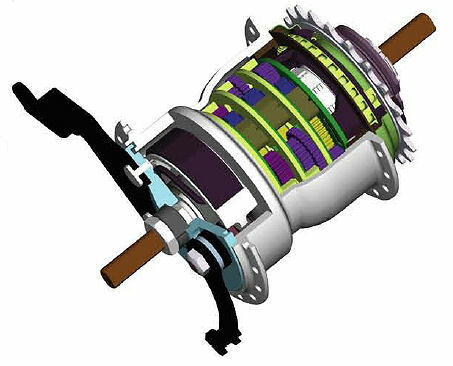 Cross-section of Sturmey-Archer X-RD8(W) 8-speed hub with drum brake. he 8-speed Sturmey-Archer hubs have an innovative, modular design with 3 planetary systems one after the other. If a module's sun gear is locked to the axle, it has an increase ratio, and if not, a unity ratio. Each of the three modules has a different increase ratio. The eight possible combinations offer eight different speeds. Because these hubs only gear up, they require a much smaller chainwheel than other hubs and are especially well-suited to a small-wheel bicycle. These hubs are most efficient in the lowest gear, which passes power directly from the driver to the hub shell, and least efficient in the highest gear, which uses all three modules. Model designations include the letter F, for freewheeling; K for disc brake and D for drum brake. The discontinued X-RR8 was available with a fitting for a Shimano Rollerbrake. There is no coaster-brake model. These numbers are based on gear-tooth counts. Also see Sheldon's Internal Gear Calculator. It is difficult for a simple planetary system to achieve a non-unity ratio near unity, and so the bottom step is large with these hubs. To avoid a large jump in the middle of the range, the large jump is used again at the top of the range. For this reason, it is best to set the second-highest gear as the level-ground cruising gear, around 75 gear inches (6.0 meters development, 5.5 gain ratio). Setting any lower gear as the level-ground cruising gear would make the top gear too high to be useful. On the other hand, if you ride in flatlands so you don't need any very low gears, your might set the overall range higher to get more gears in the level-ground gear range. The right-side ball ring unscrews counterclockwise from the hub shell, according to the most reliable information we have. Sturmey-Archer has published information indicating both directions! This ball ring does not include a ratchet, unlike those of most Sturmey-Archer internal-gear hubs. Reliability has been an issue with these hubs, though it appears to be improving with newer production. These hubs are grease-lubricated and have no port through which oil can be introduced. Oil can be added after unscrewing the left ball cup. These hubs should be disassembled and relubricated periodically. Disassembly is fairly easy with the newer models. It may be advisable to relubricate before installing a new hub: see advice here. Stout anti-rotation washers should be used, preferably both inside and outside the dropouts. See advice here. Also, gear down and spin rather than pushing hard in a high gear. As the lowest gear ratio is unity, torque on the axle decreases, the lower the gear. The sprocket is unlike the one used on most other internal-gear hubs. The center hole is much larger, and the sprocket is available only with 20, 23 or 25 teeth. The sprocket has three lugs and is held in place by a circlip (snap ring). The 20 and 23-tooth versions are flat; the 25-tooth version is also available dished. The brakeless version is especially well-suited to older bicycles with narrow rear dropout spacing. By the choice of locknuts and by using the brakeless version of the hub, the overlocknut distance can be smaller than for any other internal-gear hub with 7 or more speeds -- as little as 115 mm. If you're going to use rim brakes and a 130mm or 135mm overlocknut distance, get the "K", disc brake version rather than the "F" freewheel version. The "K" has a natively wider hub shell and better bearing placement. (Thanks to Prester John on the Geared Hub Bikes e-mail list for this advice.) But this version may also require a larger chainline. Sturmey-Archer sells cranksets adapted to this hub, with tooth counts in the 30s, and designed to work with a full chain case. These hubs shift with a pulley mechanism concentric with the axle inboard of the frame, and use different shifters from other Sturmey-Archer hubs. The newer (W) versions cleverly allow the pulley mechanism to be installed at different angles, so that only one type or antirotation washers is necessary, regardless of the angle of the dropout slots. The 2009- models are very similar to the first series, but a different tool is used to remove the screw-in right ball cup, and obviously, many of the internal parts are different. A part number ending in (W) is sometimes used to distinguish the 2009- hubs from the earlier models, but not consistently, possibly leading to confusion. The ball ring of the newer-series hubs has six notches for the ball-ring removal tool, the older series, two notches. Parts lists for hubs made since 2009, with or without the (W), show the same parts. You may compare the two parts lists for the XRD8(W) linked below to confirm this. Technical documentation is available for some of these models. rebuilding information for SWs and others. Chat forum on English bikes.